What do you mean it's the opposite? It's not. In that example image we are seeing exactly what BMD intended for BRAW, it's a better cleaner debayer. Look at the word "color" in the color checker video chart on the left. In BRAW the text for color is clean and white as it is in reality. In the cDNG shot the text isn't white and instead it's full of colored aliasing. That's bad and it's not actual sharpness. The BRAW is better. There is nothing wrong. That's part of the averaging of quality due to the poor nature of Bayer. It's better to do it in post from a less compressed image. Look over at the thread detail, and there are massive very little ssyes, massive losses. It looks like I would expect from 12:1. What lack of problem. I'd rather have both looking good with no detail loss/contrast reduction. See the discussion about the material rendering above before. Wayne Steven wrote: I'd rather have both looking good with no detail loss/contrast reduction. Compared to what? A theoretical imagining of a future sensor? As a cinematographer I have to choose what is best between the options actually available to me right now in the real world. 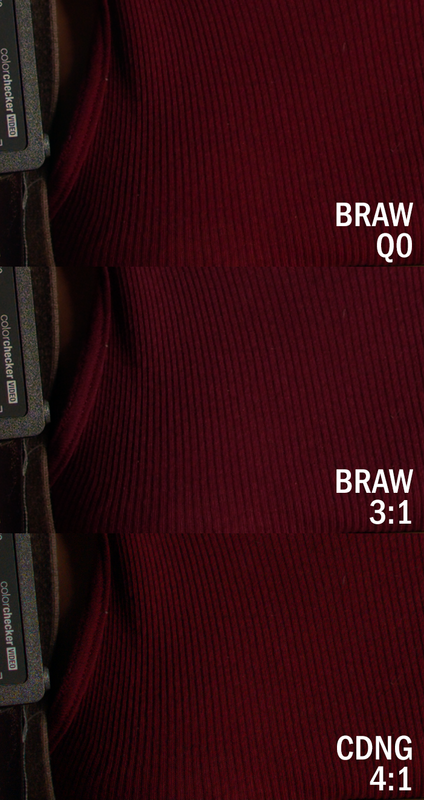 Based on everything I've seen and tested myself, BRAW is far better than cDNG, both in terms of image quality and most definitely in terms of workflow. I'm sure BMD will continue on to develop their cameras and deliver even better options in the future. Until that something better comes along, I'm going to shoot with BRAW. From the samples, Jamie, CDNG processed right. No reality avoiding argument throwing in a future sensor not mentioned. The truth is raw data recorded right to be processed to the best affect. BRaw samples above are heavily modified degraded data that give the lolipop of noise reduction and real world colour alaising data, in a way not the greatest locked in. Jamie, show us examples of what you consider is good from BRaw? Lolipop water looks great, but real vision has detail contrasted right. Wayne Steven wrote: Jamie, show us examples of what you consider is good from BRaw? Lolipop water looks great, but real vision has detail contrasted right. I'm quite happy with the above example of BRAW that shows no colored aliasing in the text. Before BRAW, my biggest issue with the Ursa Mini Pro was noise and moiré on fine details. The new debayer has improved both. And to have 12:1 BRAW files with their small file size and easy post workflow are an amazing bonus on top of the better image. If there is a better debayer of cDNG that one can get out of Resolve without the colored aliasing as an example that fits your definition of "processed right" please share an example of that and explain how to achieve it. Then your issue is with resolve. BRaw is not really doing much that can not be done better in post, providing you give a low enough compressed file to work on. I see the material sample above giving a otherly smothered smoothed out look to the details. Look at the material. It is the new issues resulting in changes which would be most difficult to recover I am interested in. I ask again. Please present some actual images that show these better results from cDNG along with a description of the methods that can be used to achieve those results in a real world post workflow. Otherwise, it’s just total speculation and whole lot of theoretical hot air. He won't come up with anything other than more inane and largely incoherent ramblings. Really requires thinking to think, instead of ramble, otherwise one gets so full one thinks intelligence is rambling. Jamie, I just pointed to one above, and me and others have pointed out the flaw, but why are you insistently avoiding talking about that? Then again, one surely wouldn't have shifted something like focus or aperture between shots would they have? That would defeat the purpose of comparison shots. I might be happier again. Not only right about the difference between the shots. But, notice the mis-colourization on the C in colour in the BRaw shot. It's just shifted colour from the dng to more yellow. It's still there. If you understand about processing, you realise the slight haze you see is caused by surrounding pixels values being blended in to reduce differences in the colors (focus, debayering, jpeg affect, denoise as others are thinking ?). Oh no, there we go again, a list of specific things and specific points, must be 'rambling' instead of being a scientist. Oh I just fail in comparison to true genuise presidental material. I'll just have to stop writing like David S. Or hire a fleet of self opinionated writers, who know everything way betterer. Wayne, you claimed that there is a better processing method for cDNG than what is shown in the image of the sweater + chart. If that better processing actually exists, please show us an actual image of it. While the cDNG may be sharper or more accurate according to a narrow definition, the image on screen is noisier and I can't fix the colored aliasing + moiré of that cDNG in Resolve, so it's useless to me. I've got to work with real options. And, unequivocally, among those real options the image from BRAW is simply better. Even if there are some flaws in BRAW, I don't really see it when watching the samples that people have released, including what was released by Blackmagic. I'm just not going to freeze on an image and zoom in looking for flaws. If the flaws are really obvious while watching a clip, that would be different...at least for me. Adam Silver wrote: Even if there are some flaws in BRAW, I don't really see it when watching the samples that people have released, including what was released by Blackmagic. I'm just not going to freeze on an image and zoom in looking for flaws. If the flaws are really obvious while watching a clip, that would be different...at least for me. I promise not to do dog and cat videos... I'll do videos of boiling water and paint drying. That should make everyone here happy. To each there own, but from the tests I have been doing I am definitely seeing a loss in detail between cDNG (UC and 4:1) and Braw (Q0 and 3:1) at 4.6k (Sigma ART 18-35mm). Less moire in the Braw but definitely a clearly visible loss of detail as well. Can't say for sure but I feel like there may be a dip in DR as well. For reference I am monitoring on a 4K Sony monitor from Resolve (Colour Managed) with just a curve applied to each clip plus tweaking the saturation (No LUTS). I am by no means an expert DOP but I am a Colourist/VFX artist so this is just my perspective. For me at this stage during the beta it would still be DNG where possible, Braw where not and Prores for quick turn arounds and Web based work. Or better yet... snail videos in slow-motion! Yes, I'll get some pet snails and shoot 120 fps slow-motion of them racing. timbutt2 wrote: Or better yet... snail videos in slow-motion! Yes, I'll get some pet snails and shoot 120 fps slow-motion of them racing. You'll be all ready for the photo finish! Ok, back. Putting everybody on a diet till the weekend as I had people in another thread I think swirling around with contrary views and merely contradicting things. Been extremely bad with tanked ultra low chromium during chemo. So wasn't up to people wasting my life for some neurosis. Jamie LeJeune wrote: Wayne, you claimed that there is a better processing method for cDNG than what is shown in the image of the sweater + chart. If that better processing actually exists, please show us an actual image of it. Ok. I am saying, as you see others say about this sample, the CDGN is clearly superior in authentic detail, and what you call superior in BRaw, is smudged out detail. That's why I'm questioning if the setup changed between samples. Also, it just looks like it retains contrast better. All things which I would thought BRaw did. But you, yourself can look for all the other debayering options (also wouldn't working the original CDGN frame instead of the still make more sense?). In BRaw we may well be talking about some baking in if it's half done on the camera, and I still question what we are seeing here if it is authentic finale BRaw or not, sorry). So, yes, going on this and other samples I see things as maybe faster but no evidence of superior instead. But it is not a simple question (the samples indicates one thing, but other factors could be at play). Ok. Sorry, that will stuff up long GOP compression and look terrible. But frames should be handy for noise, alaising, moire, highlighting and macro blocking. I've got to agree with Jamie's logic here. Debayering necessitates trade-offs...the bayer pattern is an imperfect representation that requires sophisticated processing to reconstruct into anything resembling a pleasing full color image. - BRAW makes certain choices that reduce artifacts, but also hide a (tiny) bit of detail. - Resolve's debayering favors detail, but keeps artifacts that are nearly impossible to correct after the fact. Which compromise you prefer is a matter of choice, but I'm finding it difficult to think of a real world use case in which BRAW would not yield the more usable moving image. When you throw in the reduction in file sizes, and having the entire clip in one file, well, it's kind of a slam dunk. SO unless there is some alternate way to debayer the cDNG, the argument is theoretical. It would be lovely if Resolve gave the option to choose either of the methods when processing cDNGs, but it doesn't. A bit confusing, you seemed to be agreeing with me at first. There are many debayering methods, if Resolve restricts you, load it into other products and try. I would argue, I want to see the sort of 'massive' increase in detail you see in the CDNG material sample, particularly in the crevices (look down the bottom and to the side). However, the BRaw shots virtually look out of focus there. What people should be concentrating on, is that BRaw should get a lot better than this. We are comparing 3:1 and under compression to 4:1 CDNG, which should be beaten. I would argue what people are admiring is not real quality. That's the issue, when you cull false this or that poorly, you can cull genuine quality along with it. But I still say the sample itself might be cooky. I'm going have to look for other direct comparisons, to see if it is still there. But I showed just the levels in CDNG is more striking in other samples put up to show there was no difference without eyeballing it, which pretty much ended that discussion. This is all stuff which will blend out most likely on free to air tv. I say, at 12:1, that is how it is, shrug, move on, at 3:1 or less it should look like 4:1 cdng but better, with less artifacts. I expect when more of us have the BMPCC4K, it’s going to get very interesting for people to pick the codec flavours they like to use for general purposes and for more demanding clients. I suspect there will be a lot of people shooting BRAW 12:1 and Q5 simply due to the great economies available. Until a client questions their deliverable as lacking in some visual aspect. In the current state people will shoot ProRes 422 or raw 4:1, knowing that raw or ProRes 444 XQ (on the URSA Mini Pro) are there when they need it. What will most people shoot when higher compression and lower options are both decent choices? I am looking forward to working with both ends of the spectrum. Last edited by rick.lang on Sun Oct 14, 2018 1:47 pm, edited 1 time in total. rick.lang wrote: ProRes 444 QX are there when they need it. I'm pretty sure that ProRes on the BMPCC4K tops out at ProResHQ (or lower). No ProRes444 or ProRes444XQ on the pocket. Or we're you talking about the UMP? Ok. I am saying, as you see others say about this sample, the CDGN is clearly superior in authentic detail, and what you call superior in BRaw, is smudged out detail. Well a lot of - what folks think is detail or "sharpness" - is actually just aliasing. I like the new BRAW debayering more, cause it gives me a better, more cinematic image out of the box, no more diffusion filters or third party OLPF needed. Also the level of so called "detail loss" we are talking here, doesn't matter at all, cause you only see it on a freeze frame at 400%, not in the actual running film, and only in the editing room anyway. The ACTUAL HIT of detail loos, the material takes from final delivery compression, makes the difference between CDNG and BRAW a complete nobrainer. Rick. If BRaw works the way it should then Q0 and Q5 would be fine for me. As you would know. Aliasing of the original raw is authentic detail, it depends on how it's interpreted. Interpreted well it would look more stronger unless out of focus, like the CDNG. So what's the flavour of loss you want? Both would loose some accuracy. However, the thing is, in that sample you should be getting the CDNG result with less alaising in a next generation codec. I'm not going get into it, but there is an art to this. Good to see you agree with me, as far as what happens in broacst tv, which is what I'm seeing, and if you want to say that's good enough and accept it for high quality cinema work then go ahead. I'm seeing better detail contrast preservation Frank. Some people mistake it for sharpness, but as people respond to it visually more, I figure it's important enough to keep. Olpf is one method used to give you the result you are after with more authentic detail. So, you notice the authentic increase contrast from the detail on a normal quality screen with good fov. As I have shown elsewhere. The blow up merely shows why that contrast is there. As far as the individual grain of the detail, it is noticeable subconsciously without looking, but for those with good vision (2020 is not best vision) they should see it. At the low blowup resolution it is still noticeable, as contrast is not resolution dependent. So, at usable levels of fov and resolution, it is noticeable. By the way, the rug I have my feet on has that colour, so I know what it looks like, and only the crushed matted parts look like the BRaw detail. I suspect that much of what you consider "detail" is what I would consider errors like false color ringing and aliasing. You could stop this thread dead by supplying a better debayered image that retains the sharpness you covet while eliminating the visible artifacts. If there is a tool that can do that, and that can fit into a reasonable production workflow, then I'm sure I'm not alone in being very interested in comparing its superior results. Absolutely correct. I amended my post to clarify. Thanks, Jamie. I do always keep in mind though that if I shoot ProRes 422 in 4K/UHD, I’m going to be able to optimize that media in Resolve to ProRes 444 on my 2K/HD Timeline as so far I’ve only produced 2K/HD deliverable. It’s going to make a difference in my opinion both in terms of detail and colour. No Joe, it's fact and the reality is that calling what some of us have realistically pointed out as wrong 'better', is the hyperbole opinion. It has been from the beginning, and I clocked it as such from the beginning. But as usual, the people who have to try to trump anything that challenges what they WANT in this world have to neurotically double down on it. It will never change the fact simply because it is fact, those parts of the image, for some reason, less match real life in average perception (meaning even without eyeballing it). Now, I admitted it is so peculiarly wrong that maybe there is another explanation for it, but it is still there. Even if it is something else, I will still be pointing out the fact of it being there, and right about it possibly being something else (debating has slipped towards a evil fashion about impressing people that you are right through your power don't matter how wrong you are, not reality, reality is not leaving room to be wrong in your statements. You can call that an opinion, so you can't say that it is completely wrong (as an mere opinion may or may not be. Think about it?). You have people trying to twist things for themselves, and you have even thrown in a debating technicality to score (which is bad reasoning), its about reality not these opinionated people trying to over ride reality. They are so bad, they think if you don't agree with them you must be at least as bad and coming from their tricks department. Like bully school kids, who just want it their way over reality. If these people can't stick up for reality and learn there is no point for them. However, they gave failed to prove it is entirely false detail, or on average it is worse than Braw, and have not even made sby attempt to show there is any false detail at all in that part of the image, where the Braw example just obviously is not detail. I'm going to examine the focal ain again incsse I am wrong in that way (if the part I am naively examining is meant to be on focus or it was out of focus and some error in sharpening in cdng debayering made it look in focus, but as others point out the Braw samples have the look of something else happening.). Stuff opinion, look into it and figure it out. If I gave an opinion, I'll put a if, but, maybe, on condition, then etc qualifying conditional words in it, or ssybits an opinion. You notice I use conditional qualifying words a fair bit, and you will notice those that argue don't use then much, and often ignore them misconstrueing statements (I'm not talking about Jamie here, he does seem to be one of the ones that tries to think about things a bit rather than go off on an emotional reasoning rant about what they feel but has no relevant backing. With such you can reason as they are trying to think about the things said). Why don't you examine the areas people have pointed out, which represents the more general/average image, over this hyperbole about exceptional problems on surfaces that don't turn up as much? What is more important, how it looks on a premium screen which represents the upper end of the audience's range of viewing, or how it sometimes looks? And these people are considering so limited range of aspects as true picture (which is hyperbole) rather than greater (which is quality). They fail to prove much at all versus being proved wrong many ways. Maybe you don't recognise it is not something to do with my argument, it is the personalities which always want to argue when something challenges what they Want, as wrong. I rarely ever see people that can actually do very good reasoning smd thinking do this. Joe, I have put enough years into learning the real side of the camera. You can take my word for it, there are a variety of ways to debayer and process an image, and different workflow tools should have whatever version they like. It is up to you, and others, to put in the effort to find out what is out there. I've put in too many hours already answering stuff that I shouldn't have had to answer if people were not being emotionally, morally and mentally lazy. We can all be lazy, and I've got my own issues with that from a string of sickness, but the weakest shouldn't have to do the most when he shouldn't have to do much at all, because of others not bothering to do their part. BTW: The material sample. That sort of material gives strong intensity changes depending on angle (as well as weave). I've taken a quick picture with this poor phone to illustrate, adjusted for effect. So please try not to laugh too much. Rough quick example: Larger circle represents normal spread of light in material. Smaller top circle of matted material represents contrary look given inbetween the threads in the BRaw material samples. Last edited by Wayne Steven on Mon Oct 15, 2018 9:47 am, edited 4 times in total. Before braw, one major points of capturing raw data was futureproofing. Meaning you can pull your footage out after 5-10 years and use the benefits of new debayer algorithms, noise reduction methods etc. Is it possible with braw? Unknown. What is known is that at least part of debayer is already done, noise reduction is already done. So what was absolutely logical for raw format yesterday now suddenly is irrelevant? What does open standard mean for BMD? Is redcode an open standard? Is Prores an open standard? Where is the openness when there is even no general description of how far from proper raw has braw image drifted during in-camera processing and which compression algorithm is used? Compressed raw was, up until braw, a compromize between quality and datarate. But by using wavelet compression (redcode, cineform), artifacts were kept to minimum. Now suddely DCT compression with macroblocks is just fine for raw...? I guess next we see long-gop "raw" because it is just fine for youtube vlogs. What I would consider braw is a nice balance of quality, speed and datarate, but it does not tick most of the boxes raw capture was (isn't it anymore?) intended for. So essentially braw is a low-datarate prores and just as prores has its place, braw has also. And yes, it looks nice, plays nice and so on, but imho it does not fit the use case and reasoning behind raw capture. +1 Hendrik. I'm just complaining that over a wide section of the sample here it does not look like the objective reality, which is where you start to grade your look. At a lower compression ratio a more modern codec should be able to do what CDGN does with less noise and less alaising and enhanced detail. If one wants that look, they can ruin it and smudge it out latter. Altogether it is very weird, because BM has interview statements about it being more modern and better, and I trust BM enough to trust they are right and telling the truth. These guys have been arguing enough I haven't had the time to investigate more samples to determine what is the case. My rug sample is up above to show the type of intensity distribution the material can give. Just click on it to see the second circle that shows the distribution. BRAW should keep it's name because of the hybrid nature you are talking about. Its not RAW and its not like Prores (not talking about Prores RAW). It’s in a space between, B-RAW. I like BRAW, and will mostly use it oppose to CDNG. Not because it produce a superior image, which IMO it doesn’t, but because it’s way more efficient with woth living compromise. To me, BRAW have made Prores obsolete. You have to go all the way up to XQ/4:4:4 to get more than 10bit, and you lose “RAW” abilities that you get with BRAW. IMHO, Cdng 4:1 contains more real detail than BRAW 3:1. I actually can’t believe anyone who have been playing with both formats is not able to see that. Yes, there is more noticeable moiré/aliasing in the Cdng files, which can be time consuming in post. If you have time and budget, and want that additional crispiness, than it’s worth it. It remind me about the Nikon D800 vs D800E(OLPF version with a glass that negates) debate. The whole point with the "none" OLPF version is to get a crisper image, targeting landscape photo and sutch. I find BRAW better, out of the box, for skin tones and fabrics because its smoother. Like a D800. On the other hand, if I want to shot FX shot where detail is more important than I would chose Cdng, like D800E. in addition. 3:1 BRAW seem a bit pointless in its current state IMO. I can’t see any big benefit against 8:1 or even 12:1. Seem like BRAW 12:1 is the true blackmagic. Small (fast) files with great image that doesn’t brake easy. We can use SD cards and get hours of footage… 12bit 4k and “RAW” abilities. What’s not to like. Oyvind Fiksdal wrote: BRAW should keep it's name because of the hybrid nature you are talking about. Its not RAW and its not like Prores (not talking about Prores RAW). It’s in a space between, B-RAW. Oyvind Fiksdal wrote: We can use SD cards and get hours of footage… 12bit 4k and “RAW” abilities. What’s not to like. What are these magic raw abilities braw has? You can whitebalance, tint, gain and so on any video file that has stored the latitude sensor offers (almost any log curve does it) with enough precision. These operations don't need raw data. But what braw does NOT allow are just these magic raw abilities like cooking something better from what your sensor captured in the future (advanced debayer and denoising algorithms). And this magic is what braw happily throws away (or seems to, open standard is kind of vague on this ). So very many words to still not address the point at hand: DaVinci Resolve's debayer of cDNG leaves visual artifacts that are obviously not in the real world scene and that some find objectionable. BRAW uses a different method that sacrifices some level of detail in order to eliminate those artifacts. No, I can't just <i>"take your word for it. "</i> We're both just random guys on the internet. A picture really would be worth more than a thousand words in this case. PS. I, of course, understand that it is theoretically possible to do a better job debayering the image. Clients don't care. Audiences don't care. I agree that "BRAW" is a bit disingenuous. BMD is no stranger to EXCITABLE MARKETING!!! I wish they would have called it something else, but the cat is out of the bag, and RAW continues the slippery slide towards a meaningless term. Still, most of the advantages real RAW has over BRAW are theoretical, and most of the advantages BRAW has over RAW are real, today. It's a cool demonstration to go back and re-debayer footage from 10 years ago, but how many practical applications are there for doing do? Stock footage? A feature film that is popular enough to warrant remastering? I'm finding it difficult to think of another time this feature would matter. joe12south wrote: It's a cool demonstration to go back and re-debayer footage from 10 years ago, but how many practical applications are there for doing do? Stock footage? A feature film that is popular enough to warrant remastering? I'm finding it difficult to think of another time this feature would matter. I'd compare it to re-scanning original camera negatives. Does it have practical applications? It certainly seems to have because it is done frequently and archives are the real treasure chest of studios. The downside of this comparison is ofcourse the major pita of storing raw digital originals for long enough. Glad I’m not a studio archivist today. 2018 Store our digital movie original clips? Done! 2043 Retrieve to remaster? Sorry, sir, we still have the data, but there’s nothing that can access this data. The last USB-C system in the free world died in 2038. We lost backward compatibility to USB with the advent of TRiUMP in 2024 and the free world is running on TRiUMP16 now. It’s rumored that PUTINe14 still supports USB-C, but our hands are tied with the 2020 embargo on the so called not-so-free world so we can’t even teleport our data outside our TRiUMP coalition (US, Mexico, Canada, Scotland, Australia, New Zealand, Israel, Saudi Arabia, Turkey, South Africa, Colombia, and PitCairn. rick.lang wrote: Glad I’m not a studio archivist today. I'm an Adobe beta tester. By the time BRAW was even announced this version of Premiere had been in beta for some time. It will come. New native format support includes ARRI Alexa LF, Sony Venice v2, and the HEIF (HEIC) capture format used by iPhone 8 and iPhone X." Where do you see support for ProResRAW listed? I can't find a reference to that anywhere. I "made a copy / paste"